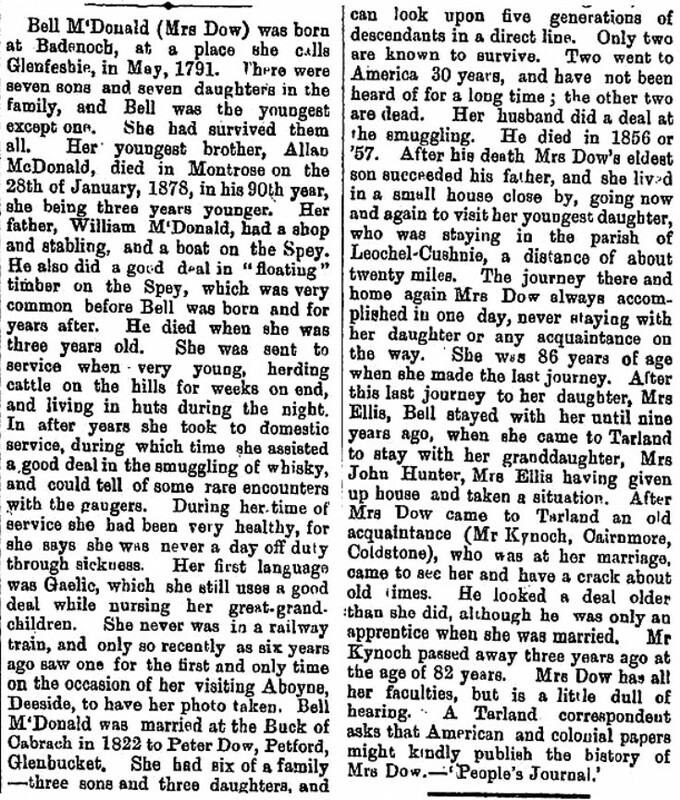 Bell McDonald (Mrs Dow) was born at Badenoch, at, a place she calls Glenfeshie, in May, 1791. There were seven sons and seven daughters in the family, and Bell was the youngest except on«. She had survived them all. Her youngest brother, Allan McDonald, died in Montrose on the 28th of January, 1878, in his 90th year, she being three years younger. Her father, William McDonald, had a shop and stabling, and a boat on the Spey. He also did a good deal in floating timber on the Spey, which was very common before Bell was born and for years after. He died when she was three years old. She was sent to service when very young, herding cattle on the hills for weeks on end, and living in huts during the night. In after years she took to domestic service, during which time she assisted a good deal in the smuggling of whisky, and could tell of some rare encounters with the gaugers. During her time of service she had been very healthy, for she says she was never a day off duty through sickness. Her first language was Gaelic, which she still uses a good deal while nursing her great-grandchildren. She never was in a railway train, and only so recently as sis years ago saw one for the first and only time on the occasion of her visiting Aboyne, Deeside, to have her photo taken. Bell McDonald was married at the Buck of Cabrach in 1822 to Peter Dow, Petford, Glenbucket. She had six of a family three sons and three daughters, and can look upon five generations of descendants in a direct line. Only two are known to survive. Two went to America 30 years, and have not been heard of for a long time the other two are dead. Her husband did a deal at the smuggling. He died in 1856 or '57. After his death Mrs Dow's eldest son succeeded his father, and she lived in a small house close by, going now and again to visit her youngest daughter, who was staying in the parish of Leochel-Cushnie, a distance of about twenty miles. The journey there and home again Mrs Dow always accomplished in one day, never staying with her daughter or any acquaintance on the way. She was 86 years of age when she made the last journey. After this last journey to her daughter, Mrs Ellis, Bell stayed with her until nine years ago, when she came to Tarland to stay with her granddaughter, Mrs John Hunter, Mrs Ellis having given up house and taken a situation. After Mrs Dow came to Tarland an old acquaintance (Mr Kynoch, Cairnmore, Coldstone), who was at her marriage, came to see her and have a crack about old times. He looked a deal older than she did, although he was only an apprentice when she was married. Mr Kynoch passed away three years ago at the age of 82 years. Mrs Dow has all her faculties, but is a little dull of hearing. 1857 January 30th at Glenbucket. Wm Reid, Registrar.